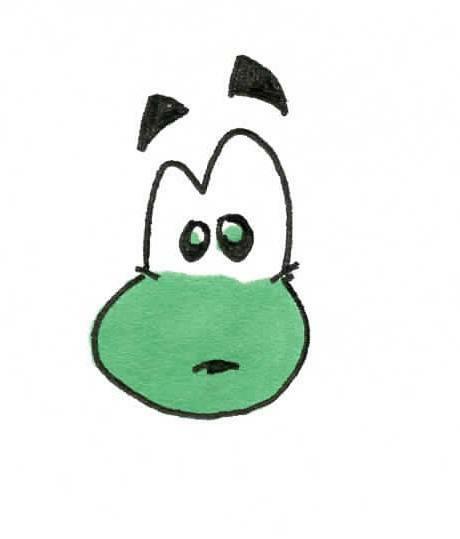 Feeble Frog is the comic strip I drew as an undergraduate for the Wesleyan Argus. Let’s face it, the character was a bit of a stand-in for the author, although the author himself made a cameo or two. Feeble Frog basically roamed around a college campus where there were regular humans and a few irregular non-humans, including the rest of the main cast. Demented Duck was Feeble Frog’s best friend, a cigar-smoking, beer-guzzling hormone machine who said and did whatever he was thinking at the time. Larry Ladybug was the voice of reason, and Wallace was a ghost-eyed monkey who got all of the most random bits of dialogue. There were plenty of other characters, but those were the main four. I’m bringing this up because it’s part of my drawing history and this is my drawing blog. I’m a pretty restless person in general — I’m not today who I was yesterday, let alone ten years ago, so I’m not a very nostalgic guy, and would rather look forward than back. So I’m not planning to upload the entirety of the Feeble Frog archives (unless I start getting some extremely persuasive comments and e-mails here). But, I will post one or two from time to time if the mood strikes. People generally liked it at the time and I honestly still think it was pretty darn decent for a college strip. Welcome old friends, new friends, fans, fiends, peers, superiors, rivals, and detractors! Hell, I don’t discriminate. I hope to entertain all of you equally. I am starting this WordPress blog with the intention of gathering together my various projects, thoughts, and creations. I will link to everything that I am doing elsewhere on (or off) the internet, so that anyone who wants to can stay up to the moment on everything I produce. Even more importantly, I will be creating original content for this website only, so please bookmark this page and check back every couple days for more happiness and joy. Thank you for reading my words and looking at my drawings. Please leave me your comments if you’re enjoying them.